Rick and Suzi are pleased to serve as missionaries with AFBM. They are sent out under the authority of Shreveport Baptist Temple in Shreveport, LA. God has called them to start a Servicemen’s Center outside Barksdale Air Force Base in Bossier City, LA. Rick served 21 years of active duty in the Air Force before retiring as a Technical Sergeant on January 1, 2006. Rick was blessed to serve in various positions in the Air Force for three different commands (the Strategic Air Command, the Air Combat Command and the Pacific Air Forces Command). He would receive 34 medals and numerous commendations for outstanding service. More importantly, in 1991, while serving in the Armed Forces, Rick would answer the call to preach and to be a full-time missionary. The Mahaneys have been used greatly of God while serving in various church positions throughout the years. Rick married the former Miss Susan (Suzi) Weil from Columbus, Ohio on July 27, 1985. Rick was saved at the age of twelve during Vacation Bible School. Suzi was saved at the age of nine while attending church camp. Rick and Suzi have three adult children, Andrew (Drew) married to Lela, Bethany married to Brandon Lester and Jordan married to Kellie. Drew and Lela have two boys, Eric (4 years old) and Nathaniel (2 years old). Brandon and Bethany have one daughter, Samantha (1 year old). The Mahaneys answered the call to the mission field while attending Shady Grove Baptist Church in Bossier City, Louisiana. Rick graduated with a Bachelor’s Degree in Biblical Studies in May 2003. While serving two stints in South Korea the Lord greatly used the Haven Baptist Church and Servicemen’s Center to prepare Rick and Suzi’s hearts for the Servicemen’s Center Ministry. 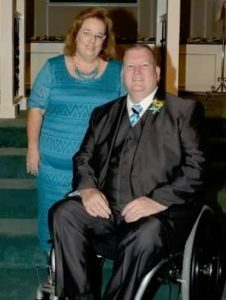 After raising support, Rick and Suzi began work on building the Servicemen’s Center behind their house in Bossier City. The Mahaneys have been Missionaries with AFBM for the past 10 years. They are excited about what God is doing and look forward to many more years serving the Lord! God calls the men and women of AFBM to serve Him in unique ways. He may also be calling you to a special role in Rick and Suzi’s ministry. Please prayerfully consider becoming a Ministry Partner with them through prayer and/or financial support.